On 12 September 2012, BICC received a high-level visit from Cote d’Ivoire led by the President of the Ivoirian Small Arms and Light Weapons Commission, Mr Adjoussou who visited Germany on a three-day study visit. BICC Managing Director Michael Dedek and members of the SALW team in Bonn welcomed him to BICC. The delegation used the opportunity to familiarize themselves with the work done by the Center in the area of SALW control. During his presentation Mr Adjoussou stressed the deadly effect of the uncontrolled proliferation of weapons, which has been caused by internal conflict in the West African nation since 1999. Assisted by the German Foreign Office through GIZ since early 2012, the national commission has collected some 1,800 weapons and destroyed 600 of them. 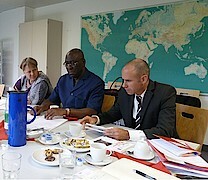 The delegation expressed an interested in closer cooperation with BICC in the future, in particular with regard to a French translation of the database for SALW identification, which BICC is currently developing together with the Verification Center of the German Armed Forces, as well as a possible hardcopy of the guide for the use by the Ivoirian police and justice authorities.